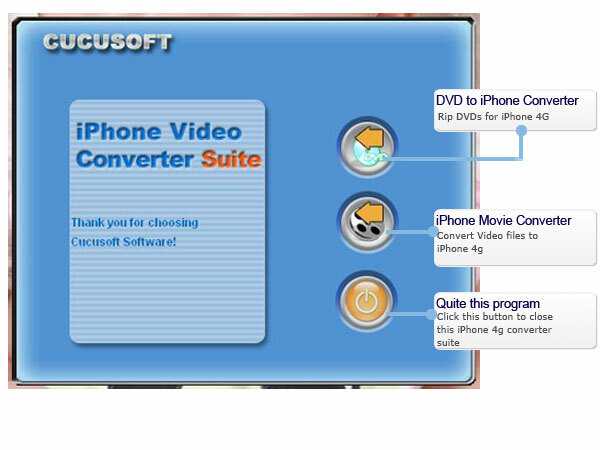 Cucusoft iPhone Video Converter Suite is an all-in-one iPhone video Conversion software solution to rip DVDs and convert video files into iPhone 4G MP4 video without losing video quality. This perfect iPhone 4 converter suite includes 2 software: Cucusoft iPhone Video Converter and Cucusoft DVD to iPhone Converter. With this iPhone Video Converter Suite, you can convert both DVD media and video file to iPhone 4. With this powerful DVD/Video to iPhone Converter, you can engjoy your movies on iPhone, iPhone 4 with easy. With DVD, it fully support MTV DVDs and Episodic DVDs. With Video, you can customize the video properties. Want to watch your favorite DVDs and funny videos on iPhone/iPhone 4? Cucusoft iPhone Video Converter Suite makes this very easy. As a professional DVD to iPhone Converter, it allows you to rip DVD movies to iPhone video and audio formats. As a professional Video to iPhone Converter, it helps you to convert all the video files to iPhone/iPod with perfect quality. You can choose the different three modes based on your preference: "Direct Mode", "Batch Mode" and "1 Click Mode". Direct Mode: You can directly click the DVD Menu to select the movie they want to rip. Batch Mode: You can select the DVD titles/chapters they want to rip via checkbox list. This mode is very easy for batch ripping Music DVD's, MTV DVD's and Episodic DVD's. 1 Click Mode: Uers just clicks 1 click to open a DVD, then the rest task will be done automatically. This mode is designed for dummies. You can customize output video file size and video quality. You can set the crop mode. eg. 16:9, 4:3, full screen and so on. It support splitting output video by DVD chapters, and titles and fully support ripping music DVDs, MTV DVDs and Episodic DVDs. With the high conversion technology, it provides an easy way and fast speed for ripping DVD and video files to iPhone/iPod.